The success of mounted police patrolling the eco-tourism park in Mount Pulag in Kabayan, Benguet to encourage more tourists going to the hinterlands now has a counterpart in this mountain resort. Tourists visiting Burnham Park and adjacent Rose Garden, being the primary tourist attractions here, now feel safer with the special tourism police unit patrols using mountain bikes. Policemen on bicycles were noted to have responded easily as the two-wheel pedaled vehicle can cut across narrow spaces and movements are constant. Police Insp. 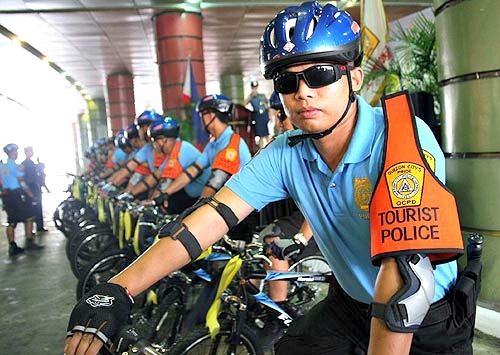 Virgilio Hidalgo, head of the special unit, said the revival of "TOP (tourism oriented police) COPS ON BIKE" had attracted more local and foreign tourists in the lake promenades, boating lagoon, bicycle area, snacks stands, rose garden shades, forest shades and football grounds. Dindin Fernandez, 19, from Pangasinan, described the bicycle-mounted policemen as "cute" as they do not exude the usual burly menacing looks while aboard their blinking patrol motorcycles and cars. James Martin, 59, a missionary from Netherlands, said "we find them (TOP COPS) very friendly and kind. I am sure that you do this in all your parks. There should be more of them protecting visitors to various parks." Being a TOP COP for years, Hidalgo said "we ourselves love this mode of patrol as it affords our daily exercise while we do our duty. "We help in conserving our supply of fossil based fuel as we also help in our drive to make all parks smoke free or safe from any kind of pollution."